ColorCure® Pink 2 White Advanced Acrylic Sealant is a premium, multi-purpose sealant formulated to provide a dry time indicator. This unique sealant is solvent-free, plasticizer-free and low VOC. The sealant goes on pink but dries white indicating when it is ready to paint and provides the maximum level of durability on a variety of substrates indoors or outdoors. It offers superior paintability and includes HomeShield™ Antimicrobial Protection to ensure against the worst types of mold and mildew. Cured sealant is mold and mildew resistant. 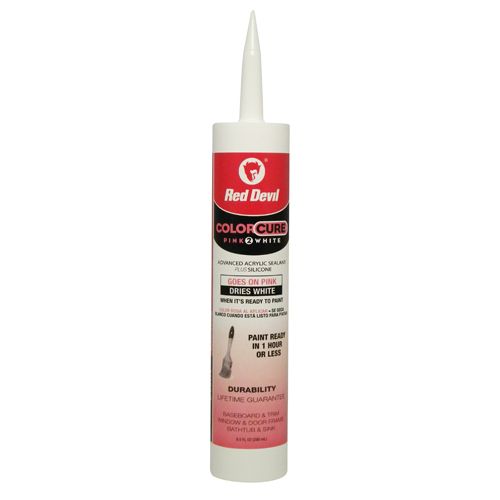 ColorCure® Pink 2 White Advanced Acrylic Sealant is a premium, multi-purpose sealant formulated to provide a dry time indicator.